If you have a super messy eater, serving a super messy food OR both try this out. I used old hooded baby towels no longer in use. Cut a slit in the seam where the hood is connected to the towel big enough for your baby's head. Put this on them so the towel part is in front. It covers all their arms and body with enough to make a "shelf" to catch all the extras! 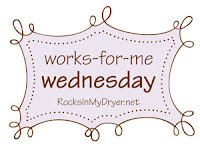 Click on the title of this post and it will take you to Rocks in my dryer- and LOTS more Works for me Wednesday tips.